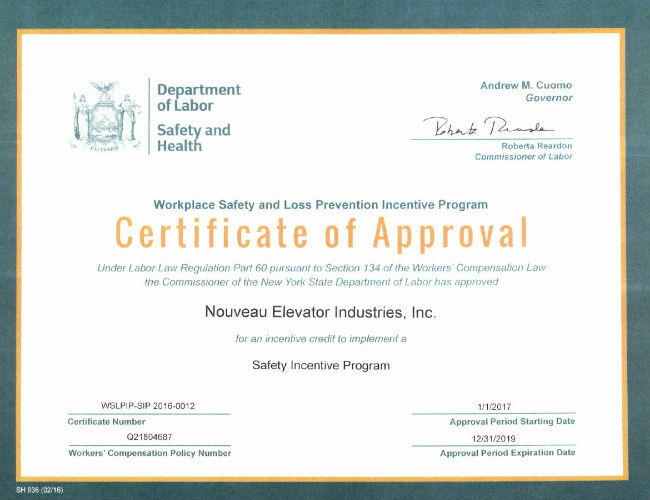 Nouveau Elevator is proud to have been awarded Code Rule 60, an award requiring top tier safety, drug and alcohol prevention and return to work standards. Our Safety First Program is the primary reason we have been so successful in being awarded such a difficult safety standard, which has only been granted to a very small amount of businesses. Our Safety First Program, which involves our safety director, executive staff and key safety professionals involves state-of-the-art procedures and protocols to handle risk on a daily basis, providing our field personnel and office employees with assurance of safety with proper safety education, equipment and management. Our Professional Safety Director is involved with field personnel on a daily basis: making on-site visits, partaking in safety meetings with executive staff and managing risk mitigation. When making on-site visits, our safety director is involved with field personnel being properly reeducated of safety standards such as a strict safety discipline ensuring no job is taken lightly, supporting our Safety First Standad where each field personnel is wearing safety equipment, performing each job using safe methods of work and properly mitigating unknown risk, a key indicator of good risk management. We ensure each field personnel is equipt with safety equipment on day 1 of working by providing the equipment ourselves, from lock-out tag-out equipment to a hard hat and safety harness. And we continually ask our field personnel about their safety equipment and give ample opportunities for our employees to get new safety equipment, whether the equipment has been used, worn down, or lost. We also have executive safety meetings involving our chief operations executive, safety department, department, division and project managers to discuss past, present and future safety concerns. Past concerns involve what incidents have occured in the industry, from other companies' incidents to our own to assure we are performing due diligence in each of our work procedures. Present concerns involve what protocols are currently going on to protect our field personnel from risk such as current high-risk jobs involving archaic equipment to routine procedures from common risky malfuctions in the industry. Our future concerns us with how our safety standards are reducing incidents in our industry and how we can continue to reduce our incidents further. Afterall, Nouveau Elevator is proud to have been awarded Code Rule 60 for its' outstanding safety standards, we've worked hard to achieve it so we mean it when we say Safety First. It's about protecting lives and working as professionals.